In November 2004, our company newly implemented cutting-edge JEOL-manufactured JXA-8500F type FE-EPMA for the first time as a private buisiness. The previous EPMA model (TE-EPMA) was a thermionic emission type, with a beam diameter that could not be focused sufficiently, and had limited analysis capability for microscopic areas. Very near surface analysis was also lacking. However, the newly introduced FE-EPMA uses a field emission type electron gun, so a small light source is possible, and resolution was greatly improved. This feature makes it possible to analyze even smaller microscopic areas. In addition, low-speed voltage analysis is made possible, and polar surface layers can now be analyzed. 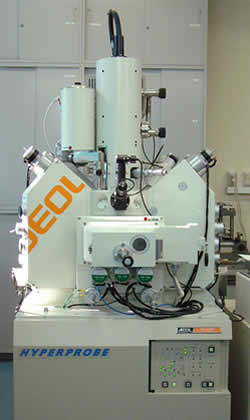 Features offered by the FE-EPMA make it possible to identify extremely small precipitates and inclusions via element mapping, and also make it possible to examine grain boundary segregation etc. As indicated by the examples above, analysis of extremely small precipitates (<=1μm), intergranular segregation etc. that could not be performed adequately with the previous EPMA model, is now entirely possible with the new EPMA. We hope you will give them a try.